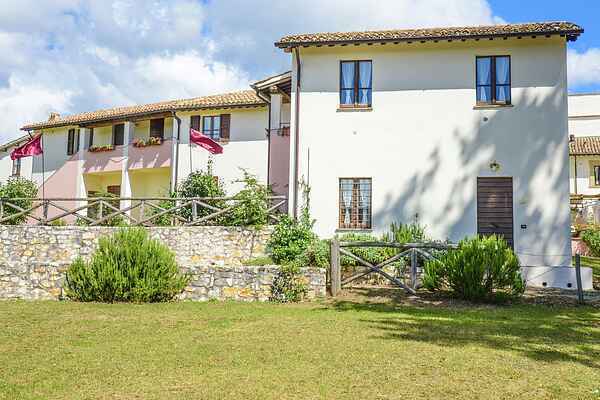 This beautiful apartment for four people lies on the ground floor and is situated in an old restored farm house on a hilly landscape, where there's also a castle as well as several other farm houses. The castle used to offer protection to the inhabitants of Spoleto. In the old farm-like atmosphere in the east of Umbria you can completely relax. Your apartment lies on the ground floor and you enter via the lawn at the front of the house. Upon entrance, you can breathe in the characteristic cozy atmosphere. The tasteful decoration, terracotta tile floors and mostly wooden furniture all add to this atmosphere. The house is perfect for people who like tranquility and beautiful surroundings. There is room to sit outside in front of the house, where you can enjoy the stunning view. You can also seek out a spot near the swimming pool. You can find shops in nearby Sellano. Around the castle you will find centuries old mountain villages, which you can reach via twisting roads. Hiking lovers will find everything they desire in the beautiful Monti Sibillini nature reserve. Here you walk past idyllic lakes and rough mountain tops. You can make cultural trips to the cities Foligno, Spoleto, Perugia, Assisi and Terni.